(Blooming Prairie, MN May 8, 2018) – For the third straight year, Minimizer is helping supply kids with the necessary equipment to ride a bike. "There's nothing better than seeing all the smiles on kids faces," Minimizer CEO and Chief Visionary Craig Kruckeberg said. Minimizer, along with KIK Marketing, the Blooming Prairie Youth Club and the Blooming Prairie Police Department, hosted a Bike Rodeo last weekend. 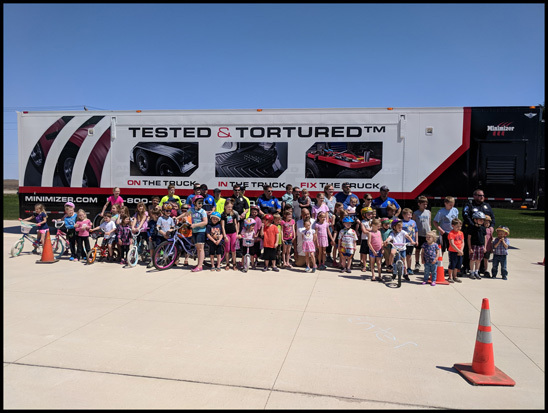 Children of all ages brought their bikes out to Minimizer's corporate headquarters for some fun and games, and they didn't leave empty-handed. "Each kid will receive a brand-new bike helmet, courtesy of Minimizer," Kruckeberg said. "They're really excited." "All the officers love children, and we love to be able to help in any way possible. Our children come first and we want nothing more than to keep them safe," Blooming Prairie police chief Greg Skillestad said. "It's great to have Minimizer here to support the kids in our community as well as the BP Police Department." "We had 74 bikes registered and 64 kids signed up to win one of the 12 bikes," Skillestad said. "Minimizer continues to make this possible every year. Without their support, we wouldn't be able to make this as great as it is." "It was a really great day," Kruckeberg said. "Any time you can help this community, especially the kids, you have to do it."